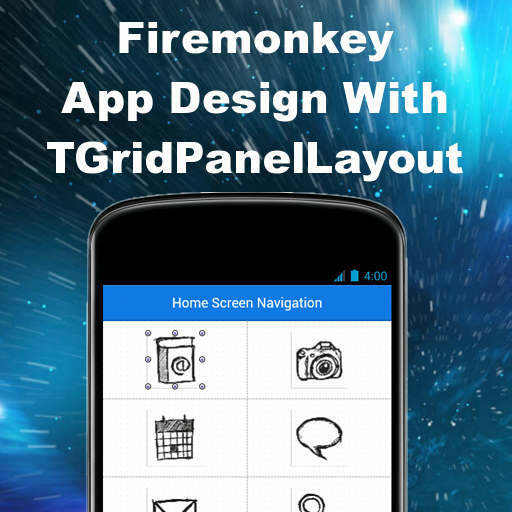 Sarina DuPont from Embarcadero has a blog post up where she shows how to use the TGridPanelLayout component in Delphi XE6 Firemonkey. I’m actually pretty amazed by this component and wonder why I haven’t seen it before (it comes with Delphi afterall). In any event basically a TGridPanelLayout is very similar to a table tag from HTML or a spreadsheet with columns and rows. However, once you drop your TGridPanelLayout on the form and align it to Client you can start dropping components on the grid and it will automatically place them in each grid field. All of the margins and padding are already automatically taken care of for you to keep the components in the center of each field so you can get to building the logic of your app as soon as possible. The default number of rows and columns is 4×4 but you can easily add more. Additionally, you could place this grid component in a TVertScrollBox and have it scroll. Head over and check out the full blog post with screenshots for setting up your own TGridPanelLayout component. I work with Delphi Xe8 Android. I Need use my Application’s components such as labels and Edits , … in persian Or Arabic language but it not supported . Please hint me how do this.